Stepper motors are a very powerful, yet accurate type of motor. The ability to ‘step’ through motion instead of to run uncontrollably like dc motors do is a great advantage. 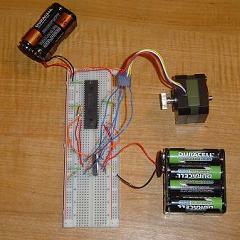 This write-up shows you how to use an L298 to control a stepper motor. Best you should change the page name title L298 Stepper Motor Control | PyroElectro – News, Projects & Tutorials to something more suited for your content you write. I enjoyed the post however. Thanks for sharing your great that I already know L298 stepper motor control.